The size of political units grew as the feudal order retreated, because the smaller princely states and the city-states were too small to exploit the greater economies of scale afforded by the gunpowder military revolution. In Germany several hundred of the feudal nobles, because of their impregnable castles and other advantages, had been able to maintain their independence of the great princely states. They were under the authority of the Emperor alone, and are reckoned among the sovereign princes of Europe, though some of them ruled only a few square miles of territory. Germany remained an elective monarchy, weakened by its connection with Italy, while France, England, and Spain were building up strong national kingdoms based on the principle of hereditary rule. But the strength that ebbed from the German kingship grew in the hereditary princely states. The Golden Bull (1356) of Charles IV definitely fixed the right to elect the emperor in the “Seven Electors”— the archbishops of Mainz, Cologne, and Treves, the Margrave of Brandenburg, the Elector of Saxony, the Count Palatine of the Rhine, and the King of Bohemia. By confirming the powers of these and other princely states, and of the numerous “free cities,” Charles IV “legalized anarchy and called it a constitution.” Even Charles V (1519–56), who in addition to Germany ruled the Netherlands, Spain, Austria, Naples, and Sicily, and large parts of the New World, was unable to put down the Reformation started by Luther, and one of the chief reasons was the support given it by the rulers of important German states. The terrible Peasants' War of 1525, in which the people of Swabia and Franconia sought to free themselves from the bonds of serfdom, only riveted their chains more firmly. Thenceforth the head of each of the several hundred German states was practically an absolute ruler, and the Hapsburg emperor was a mere figurehead, without power save in Austria and his other hereditary lands. Disunited Germany was depopulated, commerce almost destroyed, and the people burdened with heavy taxes to support the incessant wars. Frederick the Great increased his kingdom of Prussia at the expense of Austria and Poland by most unscrupulous war and statecraft, but he made his possessions a strong well-ordered state. He thus prepared the way for a closer union of Germany, under a new and stronger headship than that of Austria. In 1806 the Holy Roman Empire came to an end. By the peace of Pressburg Austria lost a large part of its territory and recognized Bavaria, Baden, and Wurttemberg as independent States. 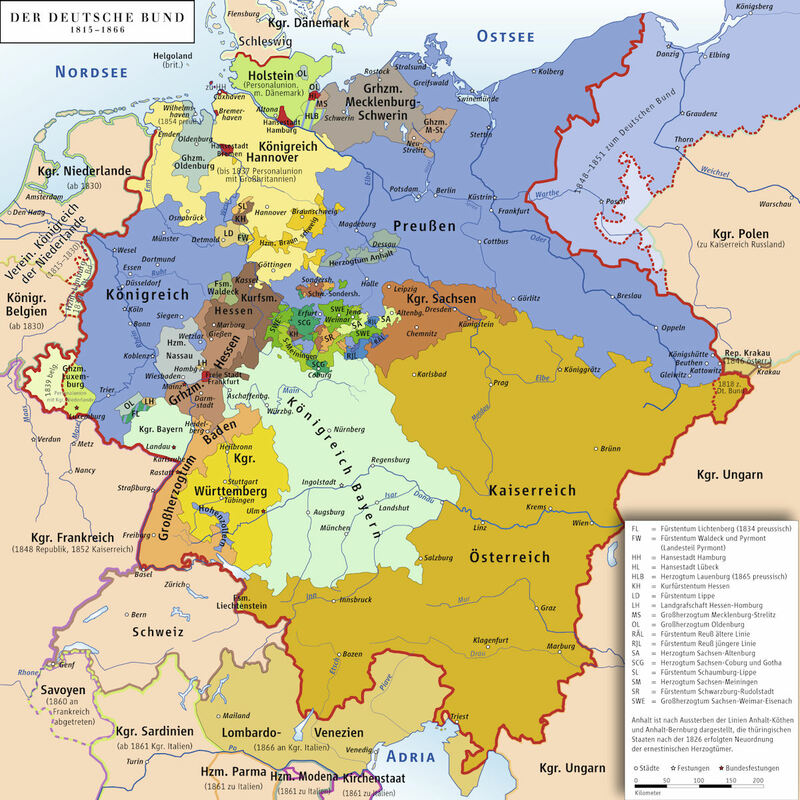 By their union into the Confederation of the Rhine on July 12, 1806, the smaller German States ceased to have even nominal connection with the Empire which was to disappear a few weeks later. The Confederation of the Rhine which included practically all of the German States except Austria and Prussia ceased to exist when the fortuned of war turned against the French. After the fall of Napoleon it proved impossible to restore the old Empire, but the equally futile and powerless German Confederation was erected in its place. After the fall of Napoleon, the Congress of Vienna (1814–1815) grouped the German states — now reduced from several hundred to 39, including Austria - into a loose German Confederation. Its only head was a diet or assembly, composed of delegates appointed by the sovereigns, which met at Frankforton-the-Main. The powers of the diet were so feeble as to make it a laughing stock. It was only a veil behind which was concealed the inevitable rivalry of Austria and Prussia for leadership. The Confederation act of June 8, 1815, was amended by the Vienna final act of May 15, 1820, which united the States for the repression of liberal principles, but gave to the Confederation no additional power for good. Until the revolution of 1848 the movement for German unity was confined largely to liberal theorists, though the customs union which Prussia had formed with many of the smaller States furnished an example of the material benefits to be gained by closer union. The revolution of 1848 forced the Governments to act. A German National Assembly met on May 18, 1848, and after a long and to a great extent fruitless debate, adopted the Imperial Constitution of March 28, 1849. Frederick William IV of Prussia was chosen Emperor. But by this time the liberal movement had begun to lose force; Austria had gained the victory over the revolutionary forces within its borders, and was resolved to oppose any scheme which would give to Prussia the leadership of a united Germany. The King of Prussia refused the proffered crown, and all hope of German unity for the time came to an end. The attempt of Prussia to establish a league of States also failed because of the opposition of Austria. 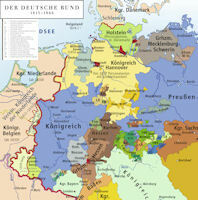 The German Confederation was reestablished, to continue until Austria should be expelled from Germany by force of arms. The actual creation of the new German Empire was the work of Bismarck, who believed that only on the field of battle—by “blood and iron”could that issue be settled. By skilful maneuvering Bismarck brought about war with Austria in 1866. Prussia's rival was decisively defeated at Sadowa (Königgrätz) and forced to submit to a reorganization of Germany which excluded Austria. The states of Hanover, Hesse-Cassel, Nassau, and the free city of Frankfort, which had supported Austria, were ruthlessly annexed by Prussia. 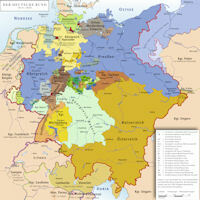 The Schleswig-Holstein affair led to an open conflict between Prussia and Austria in 1866. Upon the motion of Austria the Federal Diet on June 14, 1866, decided to mobilize the forces of the Empire against Prussia; that State, which had protested against this action, declared the Confederation dissolved. In the war which followed Austria and her allies among the small States were signally defeated, and by the Peace of Prague of August 23, 1866, Austria gave its "consent to the new organization of Germany without the participation of the Austrian Empire." 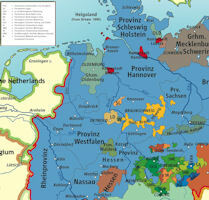 Hanover, Electoral Hesse, Holstein, Schleswig, Nassau, and Frankfort were merged into the Prussian territory. 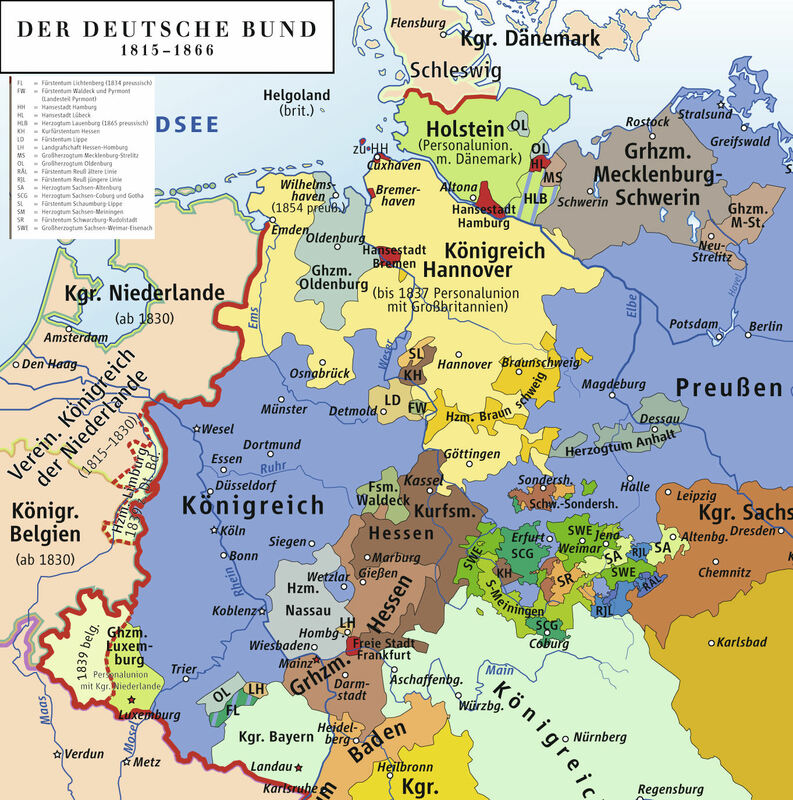 On August 18, 1866, the small States of North Germany north of the river Main entered into a treaty accepting the conditions proposed by Prussia on June 10, 1866, for the establishment of a German Confederation (1866–70). In consequence of this agreement an elected assembly met at Berlin on February 24,1867, and adopted a Constitution of the North German Confederation; this Constitution was ratified by the several States and went into effect on July 1, 1867. South Germany was left out, for Bismarck knew it must ultimately join unless France blocked his plans. 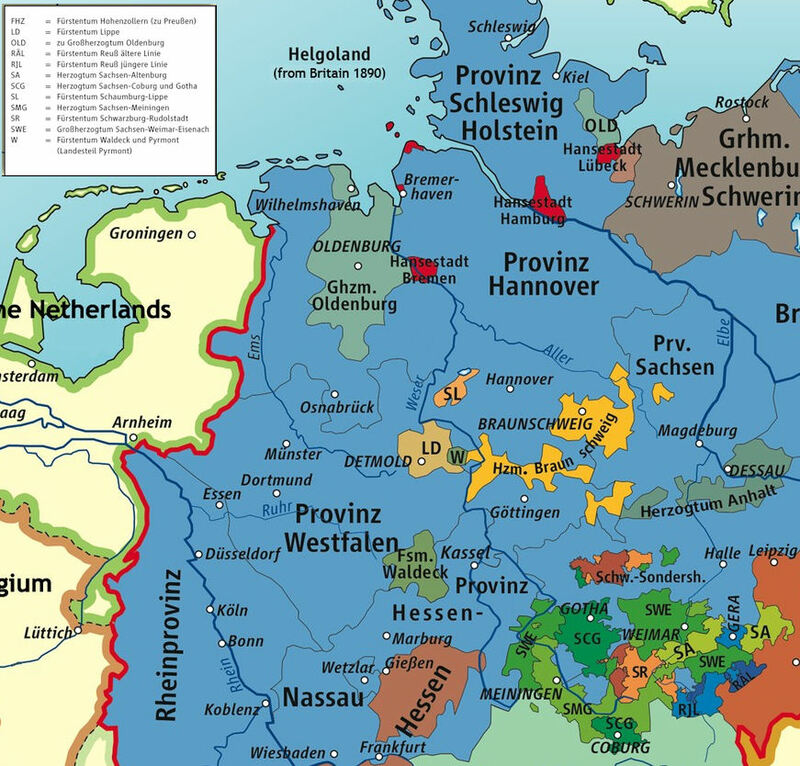 By the Treaty of Prague the relations of the South German States to the new Confederation were to be settled by future negotiations. Bavaria, Wurttemberg, Baden, and Hesse entered the customs union and concluded offensive and defensive alliances with Prussia, but held back from any closer connection; it required the national feeling aroused by the war with France to complete the establishment of the German Empire. Bismarck tricked France into declaring war, in which she was crushingly defeated. In November, 1870, the four South German States signed treaties giving in their adhesion to the Confederation; on December 10, 1870, the German Confederation became the German Empire; the King of Prussia assumed the imperial title at Versailles on January 18, 1871. 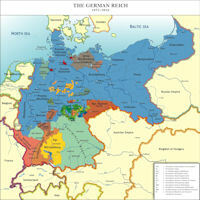 By the treaties with the South German States changes had been introduced into the Constitution of the North German Confederation; the Constitution of the Empire was now contained in four documents: (1) The Constitution of the North German Confederation; (2) the treaty of November 15, 1870, between the North German Confederation, Baden, and Hesse; (3) the treaty of November 25, 1870, between the North German Confederation, Baden, and Hesse on the one side and Wiirttemberg on the other; (4) the treaty of November 23, 1870, concerning the adhesion of Bavaria to the North German Confederation. The Imperial Constitution of April 16, 1871 was practically a consolidation of the permanent provisions of these four instruments.